A fair amount of emails make their way to my personal inbox. National retailers, local music venues, hospitality sites, trade publications, daily digests. You name it, I probably get it. Why subscribe to so many lists? Well, because I like to see what tactics others are utilizing to drive demand and engage subscribers. And, of course, these emails occasionally lead to a purchase or two. I recently received the below email in my inbox. Initially, it was the reminder that Easter is coming that got me to open (Subject: "Free Shipping + Family Easter Looks). When I opened the email, it wasn't the design or the offer that really caught my eye; rather, it was the "Share With Your Friends" feature at the bottom. It got me thinking about how, when implemented properly, this functionality has great potential for increasing reach beyond opt-in subscribers. Oftentimes referred to as SWYN (or share with your network), social bookmarking got popular with bloggers and has become increasingly popular with email marketers. Some believe it will replace the Forward to a Friend (FTAF) feature on emails. Not surprising, considering FTAF feature rarely gets any play. For me, however, whether I'm forwarding or sharing, it really boils down to whether email content is shareworthy. 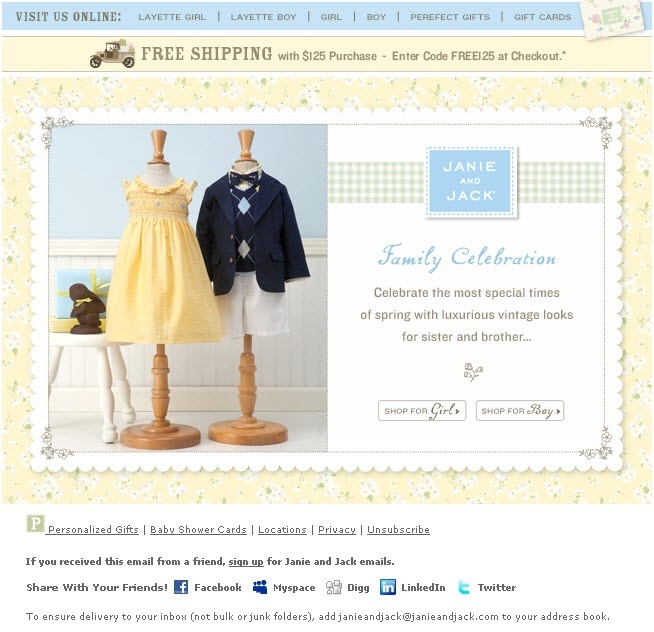 In the case of the Janie and Jack email I received, I don't believe it makes sense. I wouldn't forward or share - there's nothing really compelling about the email. However in other instances, I do believe sharing emails or offers makes sense. I hunted around, and found a SWYN case study from Loren McDonald at SilverPop that demonstrates the potential impact sharing can have. While FTAF technology rarely sees more than a .7% forward rate, SWYN is reported to inspire about two to three times that. I think it's a cool feature and, as many predict, will be the future of email. I do, however, think marketers need to be smarter with how they execute. Is the information shareworthy? Adding this feature to every email reminds me of the day with clients wanted every page of the web site emailable. LAME. Think about your audience and the content. Including every social network does not make sense. Am I going to share a retail message with my LinkedIn network? No. Be selective, and TEST. In every example I saw, the feature was included at the bottom of the message - almost like an afterthought. Does it always belong at the bottom of the page? If the goal is to get more eyeballs on your email - shouldn't this feature be more prominently displayed? Here are some examples of how various follks have integrated social sharing in emails. Do they all make sense? You decide. Any other examples? I'd love to see them.